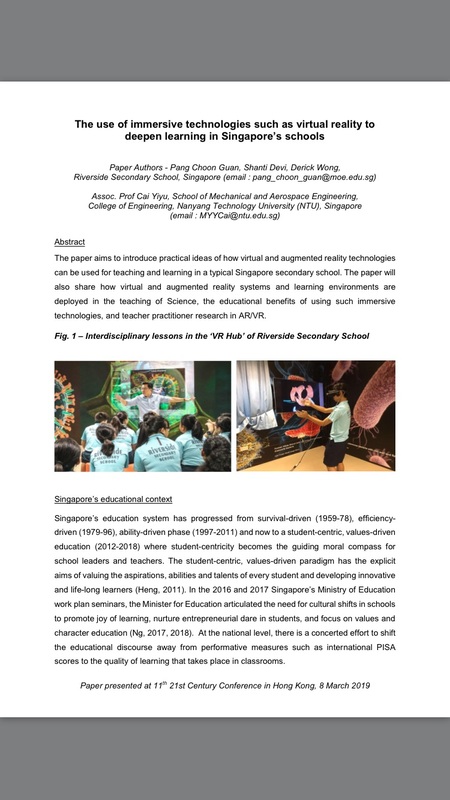 The implementation of immersive technologies such as virtual reality is contextualised as a strategy of exploration and experimentation that brings about the use of immersive technologies, constructivist pedagogies and student-centred learning environments to achieve the outcomes of the student-centric values-driven paradigm of Singapore’s education system. 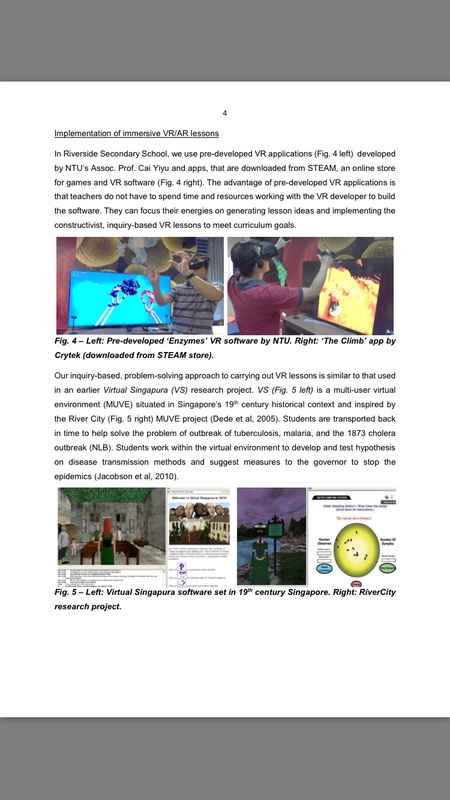 Using the results of preliminary research in a Singapore high school on the use of virtual reality to teach science, the author shares pedagogical insights on integrating virtual reality technologies to teach science and offer suggestions for future research. 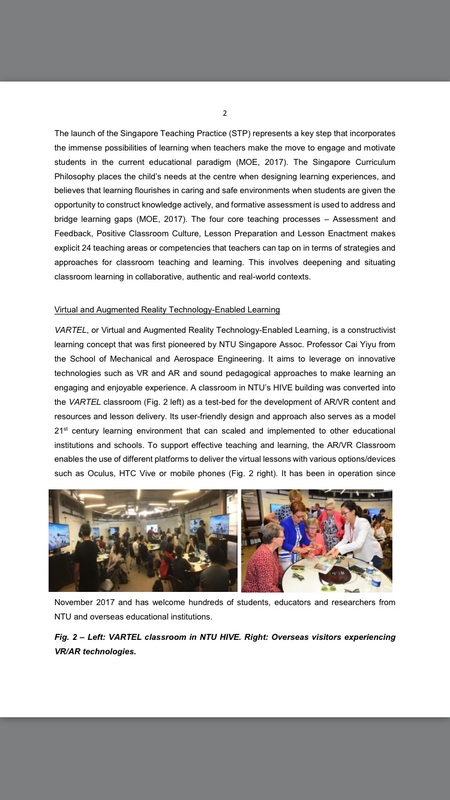 Riverside Secondary School has set up a dedicated virtual reality hub based on NTU’s concept of VARTEL (Virtual and Augmented Reality Technology-Enabled Learning) lab in the HIVE, NTU. It uses Oculus VR headsets coupled with 3D TVs as output devices for the optimal balance in terms of quality, user comfort and ease of deployment. In addition, large augmented reality posters adorn the walls of the hub to create a constructivist learning environment that fosters rich learning experiences. We envisage an evolution in the development of immersive virtual reality technologies towards widespread adoption of virtual reality technologies to the design of technology-enabled student-centred learning spaces. 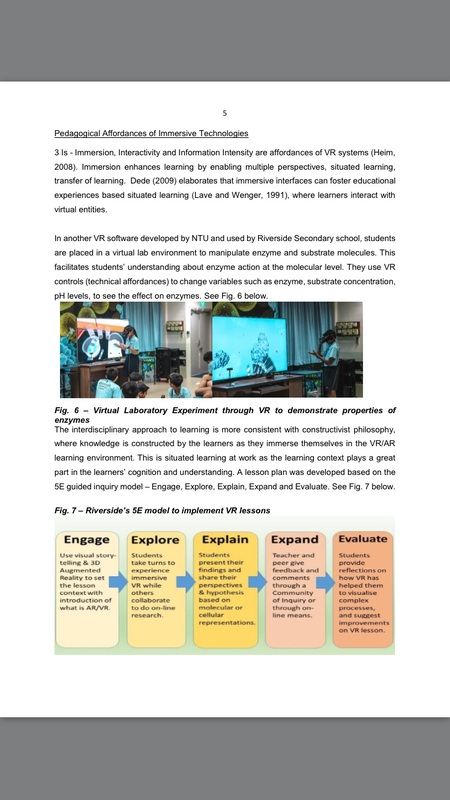 Riverside Secondary School’s VR project is an interdisciplinary project that involves the integration of disciplines of ICT, national education and biology to develop lessons in the teaching of cells, viruses and enzymes that closely integrate the affordances of virtual reality and its ability to increase understanding of the real world through immersive experiences. The resulting interdisciplinary product is situated in a three-dimensional virtual world that can help students to visualise the microcosmic cellular environment, manipulate its organelles and conduct a virtual laboratory experiment to demonstrate enzyme-substrate interactions. Students gain fresh perspectives by visualising in 3D what enzyme and substrate molecules look like in their normal and denatured states. Students manipulate the enzyme molecules and substrate molecules to understand more about the lock-and-key hypothesis that is so foundational in studies of human digestion. In another variant of a lesson using virtual and augmented reality in a lesson of the biology of cells, students collaborate with each other to discover the epidemiology of the SARS coronavirus and suggest ways to prevent its spread of mutant flu viruses. The interdisciplinary approach to learning is more consistent with constructivist philosophy, where knowledge is constructed by the learners as they immerse themselves in the VR/AR learning environment. This is situated learning at work as the learning context plays a great part in the learners’ cognition and understanding. A lesson plan was developed based on the 5E guided inquiry model. Purposeful lesson design using approaches such as 5E is anchored on sound pedagogical principles and application of effective strategies based on teaching processes and areas in the Singapore Teachers’ Practice (STP). The ability to integrate VR into lessons to achieve learning and academic goals requires the teachers to be flexible and adaptive to capitalise on the immersive nature of VR technologies, while ensuring that there is sufficient scaffolding of content and effective lesson enactment strategies to enable students to make meaning, understand and construct knowledge through collaborative and self-directed means. Fig. 9 shows the alignment of the 5E model to STP processes and teaching areas. 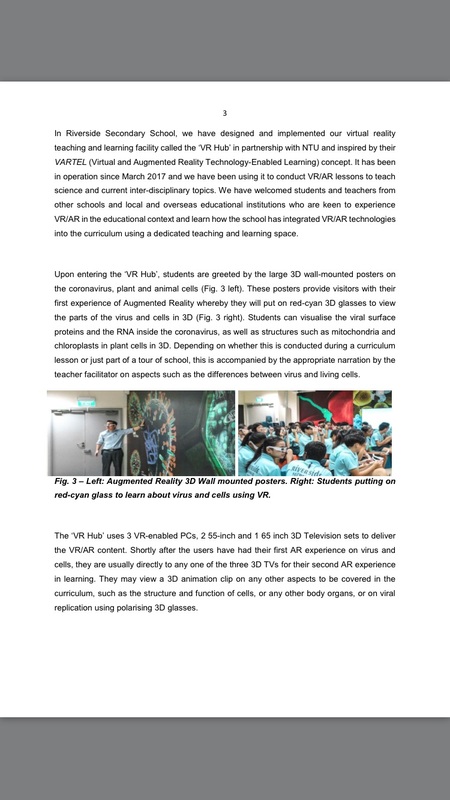 The author carried out surveys of two classes of 12 year-old high school Secondary 1 students in Riverside Secondary School who took part in VR lessons on cells this year and their responses validates the benefit that virtual reality is a powerful means of visual learning to help students better molecular and cellular representations, increase interest and motivation, and promote joy in learning. The students’ responses included “virtual reality made me see and understand the cells more than I would have just learning it thought the textbook.”, “It was when we used the 3D glasses to explore the cells on the walls as we could see them clearly”, “The VR experience was one of a kind. I have never experienced this before”. The authors conducted preliminary research to obtain empirical research data in order to find out the efficacy of learning with VR on the topic of enzymes based on the students’ test scores performance. 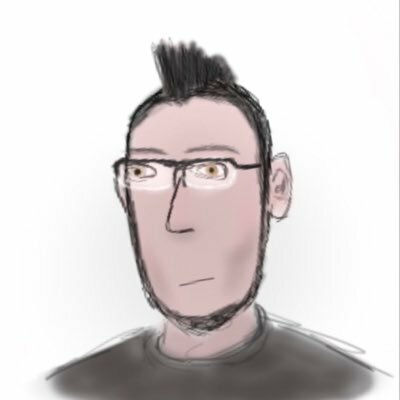 Hence, the effect size of 0.50 indicates the VR has a positive effect on learning of the molecular representations of enzymes and their interactions. This preliminary study suggests the possible impact of immersive technologies such as VR to enhance interest and motivation, as well as achievement in the learning of science for certain topics such as enzymes in the high-school curriculum. Further research should be done to probe whether the use of immersive technologies such as VR in actual learning benefits in other levels such as in primary schools, as well as in other subjects in the school curriculum such as languages and humanities subjects such as geography and history.